Driving down to Birling Gap last weekend I got a hitchhiker. 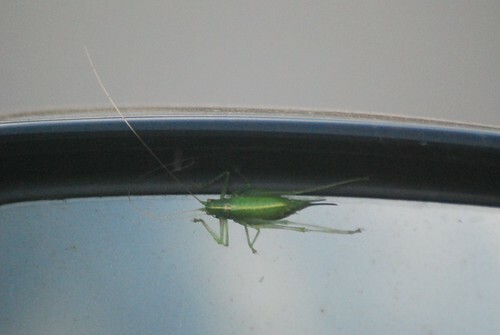 Somewhere around East Grinstead I saw something green on my wing mirror. "Just another lacewing," I thought, "Food for the spider that lives in there..."
But it wasn't one. The long antennae were a giveaway, curling the slipstream as I slid around another roundabout. My passenger was a cricket, and even though it was still a wingless nymph, it was a pretty big one. Not as big as the cave weta I saw in New Zealand, but still, big enough. There was one in miramon's small loo last time I was there. A little spider wandered up to it. The nymph wriggled it's eyebrows at the spider and the spider decided that discretion was the better part of valor and wandered off is search of easier prey. Well, it amused me in the small hours of the morning after rather a lot of booze!